For the non-readers, the excitement of the next cinematic Harry Potter installment has always been in the steady development of experiencing J.K. Rowling's mythology unfold on the big screen. And as such the films have served as a sort of conveniently abridged version of the works for those either too busy, not quite interested enough, or just seeking a perfunctory knowledge of the world of Hogwarts to fake their way through office conversation. Yet this is a series that at its heart seems to celebrate its readers the most given its painstaking adaptations and the evidence of this is sometimes its downfall via the detriment of the yawn-inducing screenplays-- as each and every important building block has been included throughout the movies. And in doing so, the directors and strategies have changed throughout which has not only been a brilliant tool in tapping into the short attention spans of the youngest audience members but also ensuring that there isn't only one vision for the Harry Potter universe that's being presented on the screen since the boy who lived in the cupboard under the stairs belongs to everyone who carries him around in their bag. Moreover, despite his great beginning-- thankfully we've come a long way from the extraordinarily dull first film from one of the great filmmakers of my youth-- Mr. Chris Columbus-- which was surpassed by his own second movie (although book-wise for Rowling number two had been a literary step backward) before Alfonso Cuaron released the masterful Harry Potter and the Prisoner of Azkaban which was and remains the crowning achievement of the works so far. Essentially, while aside from one exception with Wonder Boys scripter Steve Kloves wielding the pen for all of the transitions from books to movies-- for viewers who know the source material before going in-- the main attraction is from the visual point-of-view and the way in which this franchise has managed never to grow stale is by constantly bringing in a revolving door of new directors, cinematographers, and editors and endless behind-the-scenes talent to switch up the look. In terms of script, direction, cinematography, editing, and overall execution, the most successful adaptation all-around is still Azkaban as that final "Time-Turner "sequence has yet to be topped and Hermione was given her due for the first time in the series. And although I'd cite the first and fourth film as the weakest entries-- despite Newell's success in Harry's terrifying and violent showdown with Voldemort when death hits Hogwarts-- the one recurring complaint aside from the predictable format of "the end of summer break to end of school year standard structure" is the sheer length of the films themselves. 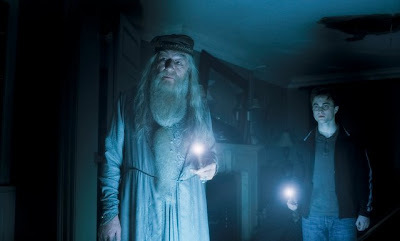 Still, I'd like to throw one more problem into the pile-- namely Rowling's over-reliance on the “overhear” device which made more sense when the kids were younger since eavesdropping was conceivably the most reliable way for the trio to acquire information... but more on that later on. And dropping extraneous details-- to the chagrin of some die hard fans-- Girl in the Café director David Yates (who had cited Cuaron's work as his own personal favorite) moved the series back in the right direction with the much faster paced fifth film which found Harry developing his own army on behalf of Dumbledore which leads to a devastating conclusion as his godfather Sirius Black is murdered before his eyes. After being asked to return to helm the rest of the series including the final book which will be broken into two films--(although I'm not sure if that's wise and wonder if perhaps blending books six and seven into two films may have led to a stronger narrative)-- Yates reveals supreme confidence right from the start with a bravura opener unlike anything we've seen before in Harry Potter that's sure to dazzle in 3D despite my admitted weariness of the format. In doing so he offers audiences an entirely new visual look by bringing aboard Jeunet's Amelie cinematographer Bruno Delbonnel that adds a striking color palette and style to the work especially in tandem with veteran Potter editor Mark Day. 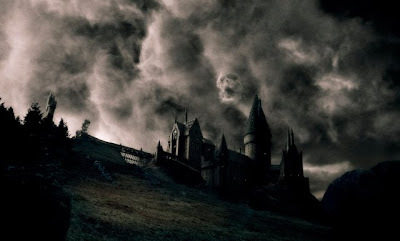 And some of the sequences in this-- the sixth Potter film to hit the screen-- are so breathtakingly gorgeous that they rival Azkaban on sheer beauty alone. Whether Delbonnel employs old-fashioned trickery to move easily into flashbacks from water drops in a cauldron into the past with a soft focus or words on a page that evolve from ink and font into kids walking in the snow-- it's always dazzling and just flows so well that an argument can be made for Delbonnel to receive a cinematography nomination for his mind-blowing work. 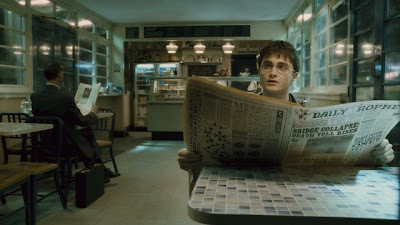 And it's a great thing too because while the film is sumptuous-- readers of Half-Blood Prince go into the theatre keenly aware that it's a very introspective, flashback heavy, chatty (a.k.a. not exactly action packed entry) which is designed to push everything in the right direction towards an unsettling “throw the uninitiated off a narrative cliff” ending as one main character is murdered and another we've been on the fence about is the one wielding the wand, thereby effectively leaving those breathlessly anticipating what's to happen next. 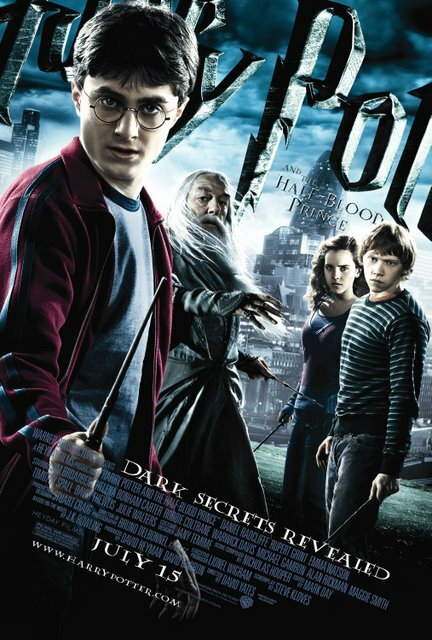 As a film, it's still quite good--if a bit too long again-- and filled with Rowling's structural Achilles heel as the trio and especially Harry this time-- since Ron and Hermione are busy obsessing over which one the other one is “snogging” (the Brit slang for kissing)-- are seen more than half a dozen times at least eavesdropping or listening in on conversations as if Rowling forgot that there were other ways Nancy Drew, Miss Marple, or any number of detectives could find clues. Since the cast is getting older-- they're predictably more caught up with their raging hormones. To this end, Harry starts to return Ginny's previously unrequited affection only to realize that she'd moved on to the athletic Quidditch player Dean Thomas whereas Ron has caught the eye of a stereotypically clingy girly-girl named Lavender much to Hermione's wrath that he hasn't realized that girls with the ability to carry on a conversation are much more interesting than those who snog so much that poor Ron is going to have the market cornered on chapstick. 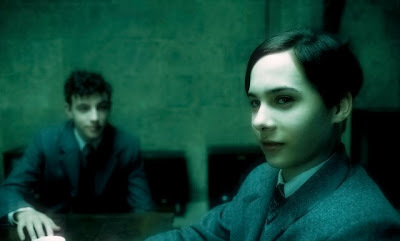 Yet, it's not all "The Young and the Hogwarts"-- as The Death Eaters have stepped up their fight on behalf of the Dark Lord and we learn early on that not only is Draco Malfoy to be an important player but that Alan Rickman's Severus Snape has promised Helena Bonham Carter's Bellatrix Lestrange to step in if he's unable to fulfill his duty. 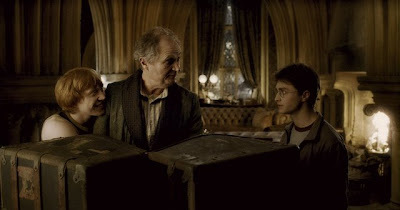 Likewise, Michael Gambon's Dumbledore has been turning Harry into a double agent to get close to one of Tom Riddle's old teachers-- Horace Slughorn (Jim Broadbent). 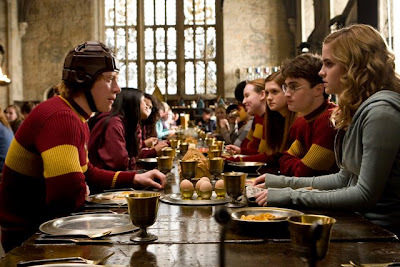 And despite the tradition that the final showdown is always the most exciting-- honestly the one captured in Half-Blood Prince isn't quite as memorable as some of the ones which have come before it. 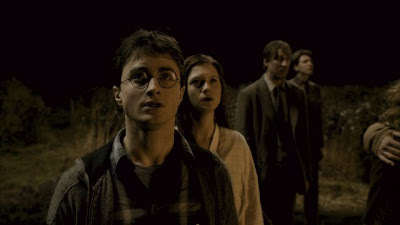 One of the reasons for this could most likely be because the events leading up to the big murder were executed with such overt Christian symbolism like we were watching a Charlton Heston movie to the point that afterward others including myself wondered when it suddenly became The Ten Commandments thereby in making these choices, it pulled viewers out of Harry Potter suspension-of-disbelief and into post-modern, pop-culture referential mode. 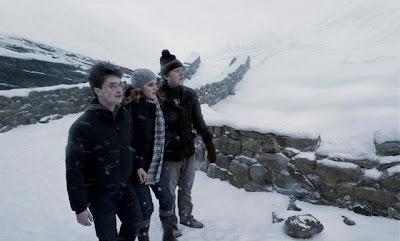 Additionally, in the book although Harry was outnumbered and out-wanded to help prevent a beloved friend from death, there was much more to the scene than having him stand there like yet another "overhear" in an anti-climactic fashion. Despite this, there is one amazing sequence that keeps you in check within the film that I don't remember-- at least to this extent-- in the novel which takes place at Christmas at the Weasley household when Bellatrix Lestrange shows up and a huge chase through the cornfield ensues as though we were in a vintage horror movie classic. 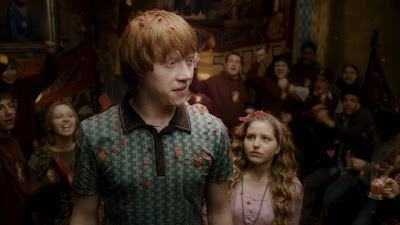 Furthermore it's surprises like these-- unexpected, away from Hogwarts, brilliantly lensed and pieced together in the most dynamic way that heightens the tension which brilliantly keepsus watching even when we're left realizing that this time around, Ron and Hermione have very little to do (with the former given hardly anything save for the obligatory comic relief scene). And likewise the filmmakers will definitely have their work cut out for them in making us buy into the Harry and Ginny relationship in Deathly Hallows since the ultimate few second "snog" looked about as passionate as a walk to Hagrid's hut. And in the end, for the readers who've been joyfully treated with Delbonnel's beautiful lensing, you'll find yourself growing excited and anxious for the plot division of the next book since obviously the big revelation that sets up the final quest for the end of the series is revealed in this title. Yet this one may be rough going for the non-readers given the lack of action in comparison to the rest. However, for the patient viewers who manage to watch all the way through-- the best achievement of the picture's final sequence (and indeed the film itself) is that the murder and perpetrator are so startling that you may find yourself going over to the bookstore to grab Hallows just to see what happens next.